Haute Decor Over Door Adjustable Wreath Hook and Hanger - Holds up to 20 lbs. You can used it in Bathroom, Bedroom,and outdoor. 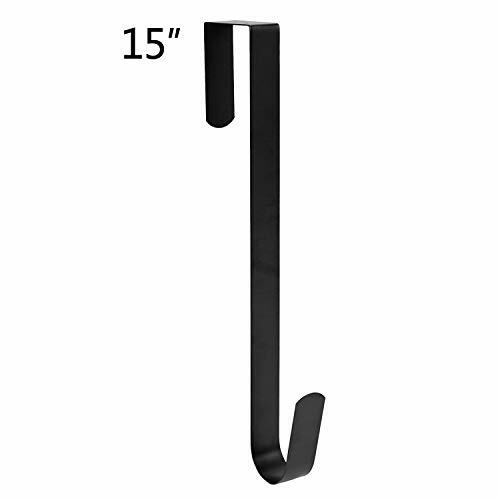 Hang and store your hats, coats, purses and many more items right with this over the door hook accessory. 【STURDY METAL This Wreath Hook made of high quality durable metal with sturdy steel to protect surfaces.The door wreath holder with Smooth surface will not scratch your fingers. 【PERFECT FIT YOUR DOOR Length:15inch,Overall Width :1.18,Over the door width:1.97inch,thickness:0.04inch. Suitable for doors below 1.97inch thickness. Ultra-thin design. Let you easy close the door. 【NO SCREWS DOOR HOOK Do not need any tools, Easy put the wreath on the door.Dont worry abou the door wreath hook will scratch your door.or damage to surfaces. WIDELY USED WREATH HANGERS】This metal wreath hanger is perfect to display wreaths,and holiday decorations. The wreath holder to hang and store your hats, coats, purses and many more items right with this over the door hook accessory. 18-MONTH WARRANTY】Unconditional 18-month warranty on outdoor wreath hanger.Note:Wreath pictured is for display purposes only. PREMIUM STRONG METAL - Engineered to hold towels, ornaments and other items with a relative amount of weight without any issue. This sturdy metal ensures surfaces do not get damaged with a smooth coating to blend in with your home decor. 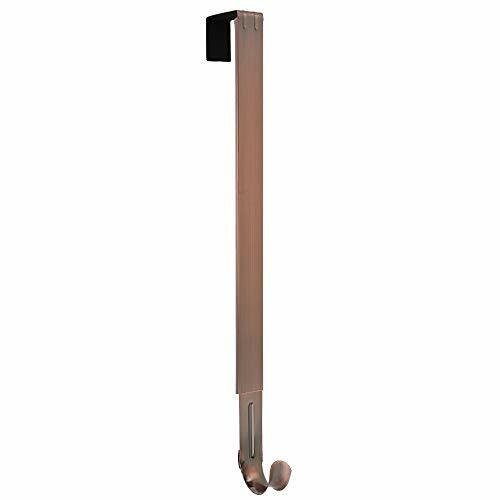 ELEGANT DESIGN - Designed to match your decor, this hook will match almost any environment with ease. Ultra thin design allows for fitting in almost any room as well. Doors close without any issue NO SCREWS - That's right! Just slap the metal hook onto your door and you're in business. No need to screw in and damage your home, just hook it! INTUITIVE - Organize your home much more efficiently with these guys. Instead of throwing your towels and clothes onto the floor, throw it on the hook! Have a sign welcoming guests and other peoples when they reach your doorstep. It's that easy. The amount of storage you'll have will increase and save tons of space. IT'S ALL ABOUT LENGTH - At 12", this long and hard hook most ornaments and clothing items with ease. These were engineered with modern door heights in mind to keep a classy look. Scarfs and coats will hang with style. PREMIUM STRONG METAL - Engineered to hold towels, ornaments and other items with a relative amount of weight without any issue. This sturdy metal ensures surfaces do not get damaged with a smooth coating to blend in with your home decor. NO SCREWS - That's right! Just slap the metal hook onto your door and you're in business. No need to screw in and damage your home, just hook it! INTUITIVE - Organize your home much more efficiently with these guys. Instead of throwing your towels and clothes onto the floor, throw it on the hook! Have a sign welcoming guests and other peoples when they reach your doorstep. It's that easy. The amount of storage you'll have will increase and save tons of space. IT'S ALL ABOUT LENGTH - At 12, this long and hard hook most ornaments and clothing items with ease. These were engineered with modern door heights in mind to keep a classy look. Scarfs and coats will hang with style. First Impressions are everything! Ditch the nails or other hardware and hang your wreath with our ADJUSTABLE LENGTH WREATH HANGER. Decorate in your own style with this easy to adjust WREATH HANGER making it the perfect height, extends from 16.5 to 25 inches. We strengthened our best-selling 10-lb capacity metal wreath hanger and are excited to offer this version with a 20-lb CAPACITY! Just like the popular original, the piece that fits over the door is padded with felt to prevent scuffing the door. Fits doors up to 1.8 inches thick. The ADJUSTABLE WREATH HANGER is offered in a variety of finishes Antique Brass, Brushed Nickel and Oil Rubbed Bronze. ADJUSTABLE over-the-door WREATH HANGER that extends from 16.5 to 25 inches in Height. Allows for a range of Wreath sizes! Details of Christmas Wreath Hanger: Size:14.9-25 inches extended,hanger width 1.14 inches,fit doors 1.8 inches below Weight Capacity:Up to 20 lbs Color:Black Material:Sleek strong metal Usage Occasions:Front door,interior doors,wood doors,metal doors,glass doors Advantages of Wreath Hanger: Adjustable Wreath Hanger Adjust length from 14.9-25 inches,long enough for normal or higher front doors,indoors,fit various size of Christmas wreaths,holiday decoration,autumn wreath. Protect the Door The top of wreath hanger is sleek and smooth,won't scrape away the door frame;With foam padded inside the hook,protect the door well. 20 lbs Sturdy Metal Wreath Hanger Made from durable metal,could withstand the weight of a "real" wreath or other goods up to 20 lbs,and maintain it's shape for a long time. Functional and Easy to Use Widely used outside doors and inside doors for wreaths,holidays decoration,hat,cloths,bag.No scratch and screw hole,easy install,space-saving and easy to use. Package Contents: 1 christmas wreath hanger 1 user manual 1 storage bag BE CAREFUL!!! Be sure the width of your doors is narrower than 1.8 inches if you are getting this door wreath hanger. Maximize your storage space with the VALORCASA Over-the-Door Hook. Offering everyday, out-of-the-way convenience, the hook makes it easy to get organized and clean up unwanted clutter. The hook creates instant hanging space, perfect for bedrooms, bathrooms, cabins, or anywhere there's a door and a need for extra storage options. Overall, the single-hook unit measures 2 inches wide by 15 inches tall. This metal wreath hanger is perfect to display wreaths,and holiday decorations. 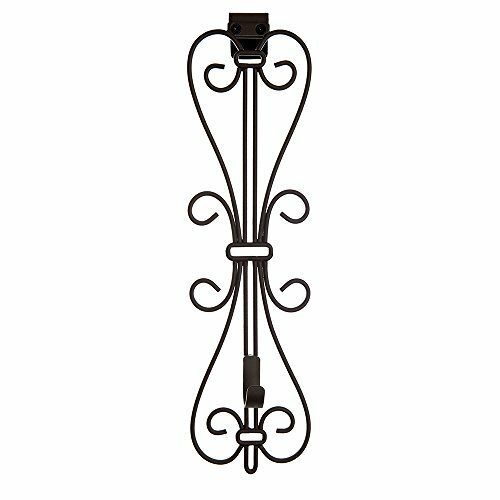 The wreath holder to hang and store your hats, coats, purses and many more items right with this over the door hook accessory. Darice's Plastic Door Wreath Hanger is perfect for hanging the Christmas wreath. 12 Inch Size. Plastic Hanger. Color is Clear. Everyone knows the best part of any holiday is getting to decorate. Take your holiday decorations to the next level with Haute Decor's adjustable wreath hanger. This gorgeous wreath hanger is high-quality and designed to withstand the elements, so you can hang up your Christmas wreath, Easter wreath, Halloween wreath...even your Boxing Day wreath! No matter the season, no matter the holiday, this wreath hook is the perfect way to display your impeccable style. Finally - an easier way to display your wreaths. 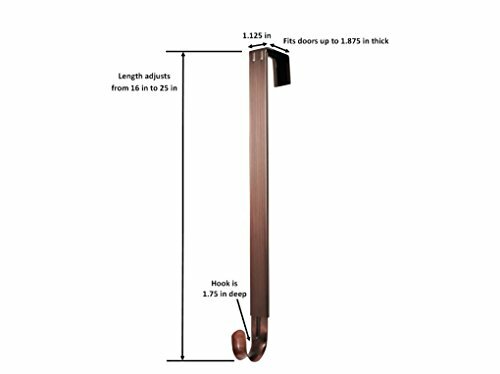 Our proprietary slide mechanism adjusts easily and extends from 16'5" to 25", making it appropriate for doors of nearly any size. There's no installation required: just slide the hook over your door and voila! It's ready to hold a wreath. Special pads on the back protect your door from scratches. Plus, our adjustable wreath holder comes in a variety of finishes to match your mood and style. ADJUSTABLE - Hang any size wreath on any size door! Our special slide mechanism allows for easy adjustment. Extends from 16.5" to 25" in height. STURDY - Our adjustable wreath hook withstands Winter gales and Fall storms. The outdoors are no match for our wreath hanger. Made of premium-grade, all-season metal. EASY INSTALLATION - Just hang over your front or back door! No screwing, nailing, or drilling required. Fits doors up to 1.8 thick. SAFE - Soft pads on the back of our adjustable wreath hanger protect it from scratching your door. That means whether you have a wooden door or a glass door, it will be protected. BEAUTIFUL - High-quality finishes blend in to your decor. Available in four finishes to transition seamlessly from season to season and from wreath to wreath. Extends length from 15.15" to 25.19"
If you have any questions or doubts, please do not hesitate to contact us via e-mail at any time, 100% money-back or send free replacement to you, solve your problem within 24 hours. 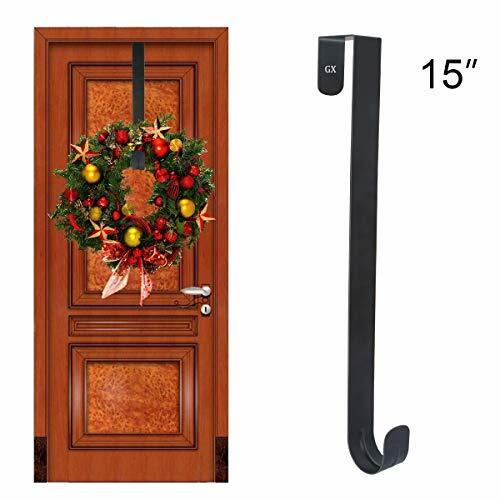 Wreath hanger for front door is innovative design, ultra-thin, easy to open and close the door.Allows for easy placement,removal. Christmas decorations in your own style with this easy to ADJUSTABLE wreath door hanger making it the perfect height. Door Wreath hanger can hold the Christmas wreath, decor your door and increase your home festive atmosphere. 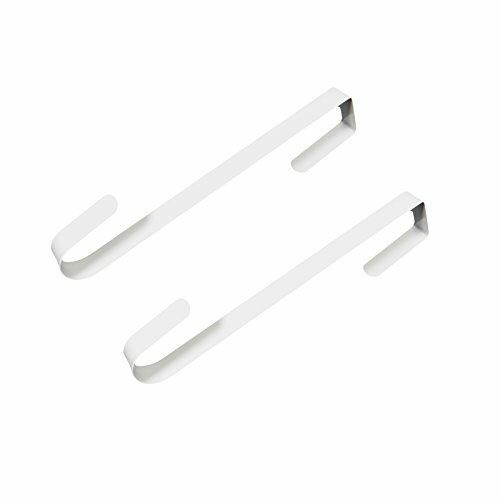 Also can be widely used in bathrooms door, bedroom door, give you more convenient to hanger your clothes, coat, handbags, umbrella etc. Wreath hanger anti- scratch, anti-oxidation, smooth surface, effectively prevent the door and clothes, coat, handbags from being scratched. 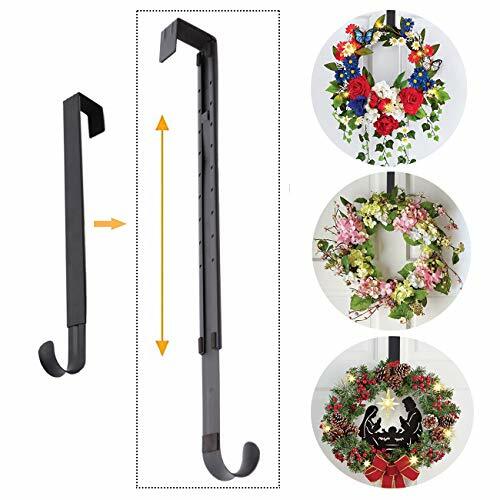 MULTI-FUNCTIONAL Over the door wreath hanger not only use in holiday, Christmas decorations but also perfect for hanging your hat, coat, handbags or other daily accessories. Have a beautiful wreath and want to showcase it against your door? Why not add an elegant and festive wreath hanger. 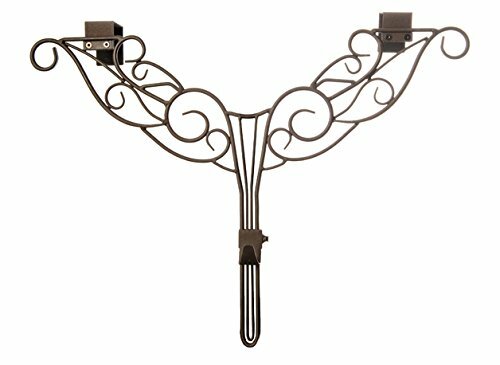 The unique double top hanging bracket design offers extra strength and a stunning unique design. The hanger is also adjustable to suit your door style: whether your door has a window or decorative molding on the front or just recessed decorative trim, the adjustable wreath hanger is the perfect solution. Each hanger is designed to hold your treasured wreath without causing damage to your door. The classic design is scrolled in sturdy, durable iron and will hold up for years to come. A perfect companion to the Garland Hanger! Warranty: One-year warranty against manufacturer's defects.